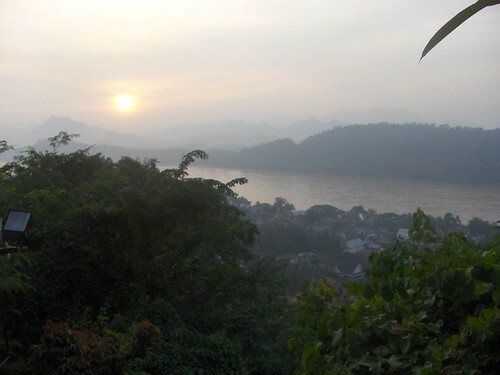 Turns out, Luang Prabang is a beautiful, laid-back and very welcoming city. 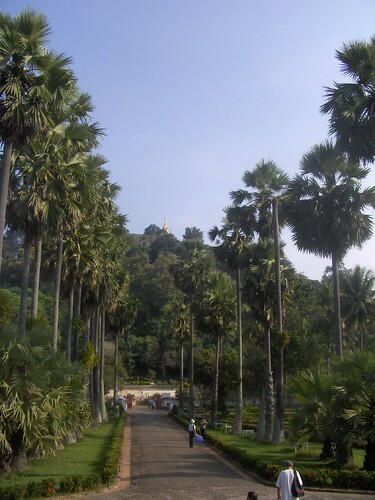 Nestled between mountains at the confluence of the Mekong and Nam Khan rivers, it’s a picturesque and all-around pleasant place. All palm trees, lazy river boats and old wats. 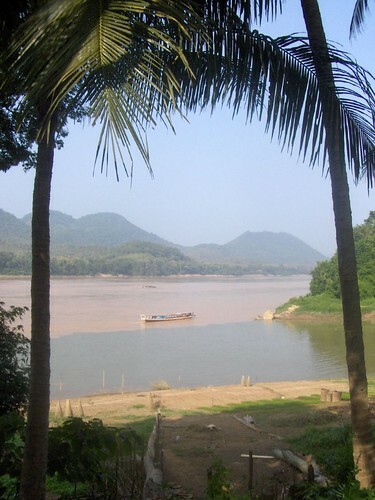 (The Mekong is the muddy river in the back). 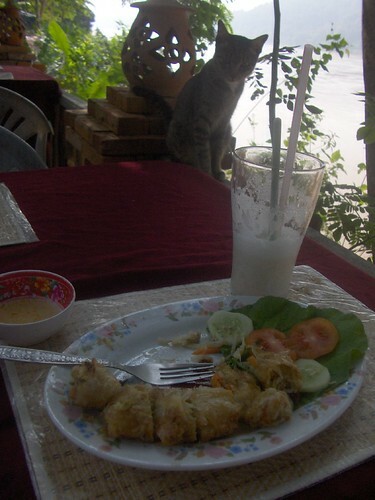 She was very interested in those spring rolls. 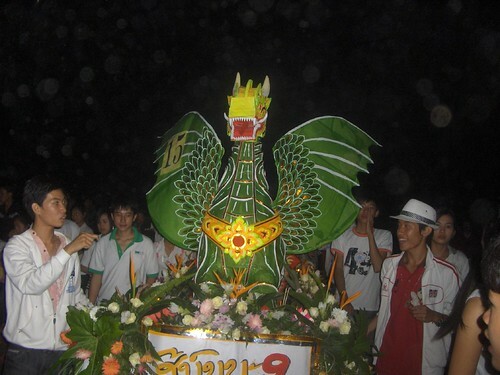 I think also a lot of the city’s charm comes from the fact that the Laotian people are generally really friendly. In every other country in Southeast Asia tourists get hassled constantly to have a tuk-tuk ride, or buy some piece of crap, or get a massage, or take a city tour to my brother’s suit shop. It’s unceasing, and often very sneaky. In Thailand, Chiang Mai in particular, stores send people out to befriend tourists, and pretend like they’re being helpful, but are really just surreptitiously guiding the unsuspecting tourists towards the stores for a commission. It’s one of the things I like least about this part of the world—that you can’t trust anyone, and have to constantly be defensive. So I’ve built up a good instinctive, dismissive reaction to anyone who speaks to me on the street—shaking my head, not looking at them and clearly saying “no”. If you just ignore people they assume you didnt hear and get louder and keep repeating themselves, following you, and often grabbing your arm or shoulder to get your attention. And you definitely cant say something indecisive or sarcastic like “maybe later” or “ill think about it” because that’s interpreted as “definitely later” and “im interested in purchasing your crap”. So a clear “no” is my default expression. I can rant about this forever. 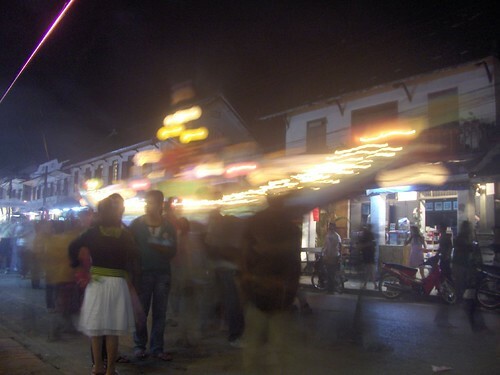 But anyway, imagine my confusion when I get to Laos and everyone I pass on the street just smiles and says “sabaidee“. At first I didn’t know what that meant and assumed they were trying to sell me some sabaidee, whatever that might be. But I soon learned it means “hello” and they’re all just being genuinely friendly. Like friendly without a catch, or any expectation of getting money later. So refreshing! 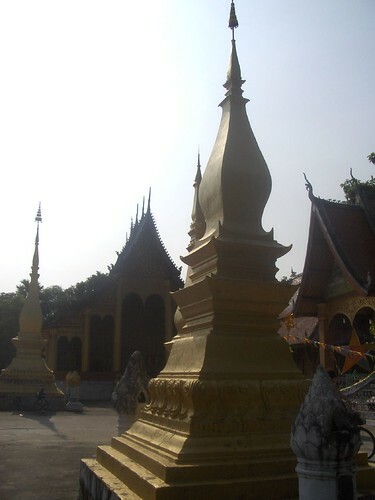 I had heard that Laos is the most pleasant country to visit in southeast asia, but it’s really true. Sure there are still aggressive tuk-tuk drivers and you get hassled in places like markets, but in general it’s much more relaxed than anywhere else I’ve visited. You can actually let your guard down there and enjoy the culture a bit. I mean everyone did. The city felt like a war zone at times..
all of which were covered in candles, and then sent sailing down the Mekong into the darkness. 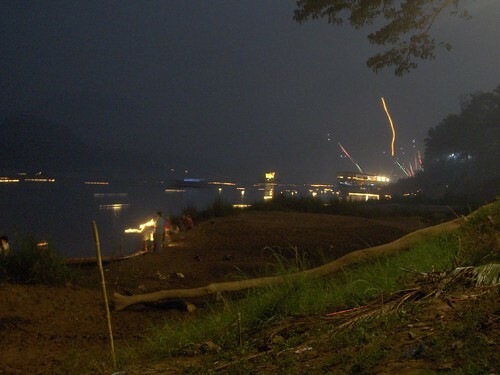 Individual people also launched little floating wreaths with candles as well, so the Mekong was covered with lines of floating candles. it was difficult to capture with my crappy free HP camera, but you get the idea maybe. 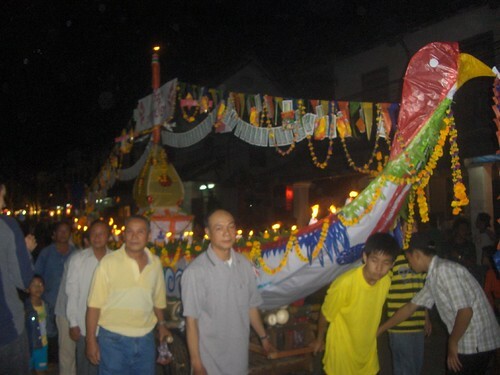 The overall effect was very peaceful and beautiful and festive. I love stumbling across random local festivals when I am traveling. It really lets you see a side of a culture that you dont normally get to experience, and makes a place all the more memorable. 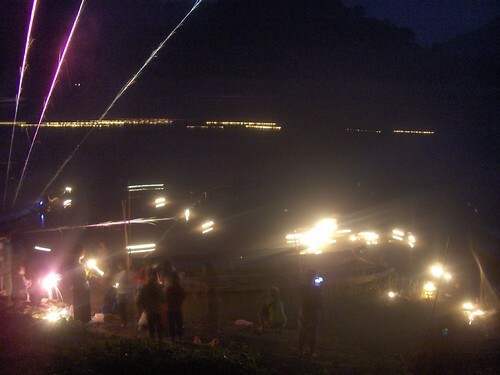 Ill always remember the celtic midsummer festival in Asturias, for example, or happening across the dalai lama’s birthday party in Ljubljana. 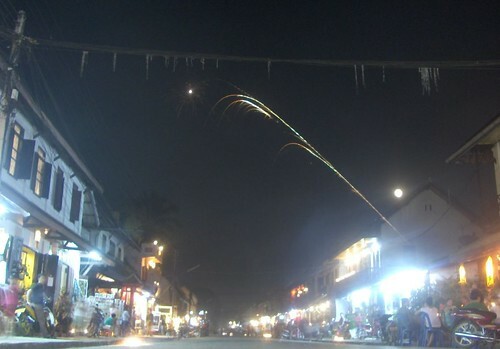 And I think I’ll always remember Luang Prabang. It’s a very singular place. 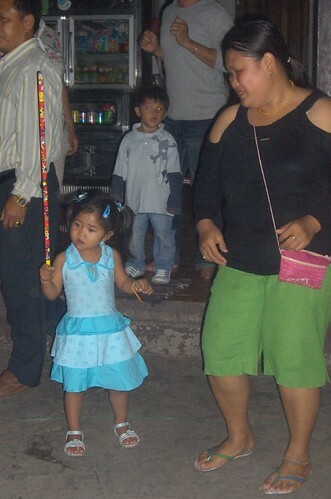 Was that little girl holding a firecracker taller than her? If so, that is truly a terrible idea. Other than that, Laos sounds awesome. The opposite of Laos-y!